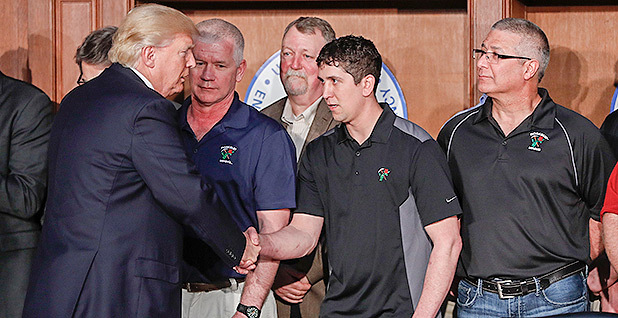 President Trump shakes hands with employees from Rosebud Mining Co. before signing an "energy independence" executive order yesterday. Photo by Pablo Martinez Monsivais, courtesy of AP Images. President Trump never uttered the words "climate change" yesterday as he snuffed out former President Obama's plans to curb greenhouse gas emissions. Speaking at U.S. EPA headquarters, flanked by coal executives and their employees, Trump said the "energy independence" executive order would usher in a "new era of energy" that would eliminate federal overreach, shower the country with wealth and put miners back to work. The president singled out the Clean Power Plan, Obama's rule to curb emissions from the power sector, as the greatest regulatory threat to coal miners. "We are going to have clean coal, really clean coal. We are going to cancel job-killing regulations — by the way, regulations not only of this industry but every industry. We are going to have safety, clean water and clean air, but so many [regulations] are unnecessary, and so many are job-killing," Trump said. "You know what this is?" Trump asked the miners as he prepared to sign the order. "You are going back to work. Ready?" That neither Trump nor EPA Administrator Scott Pruitt, Vice President Mike Pence, Energy Secretary Rick Perry or Interior Secretary Ryan Zinke, nor any of the two dozen lawmakers or industry leaders in the EPA Map Room mentioned climate change yesterday was not a coincidence. The executive order is the latest and most sweeping step in the administration's unabashed effort to weaken or eliminate federal efforts to study climate science, curb carbon and protect vulnerable parts of the United States from flooding and sea-level rise. In addition to rolling back the Clean Power Plan, the order targets EPA and Bureau of Land Management regulations on methane emissions from the oil and gas sector. It reopens BLM regulations on hydraulic fracturing, eliminates Obama's Climate Action Plan and cuts down federal calculations of the social cost of greenhouse gas emissions. The Department of Energy, Trump said, will have a role in fostering employment in the energy sector. "Together, we will create millions of American jobs, also so many energy jobs, and really lead to unbelievable prosperity all throughout our country, and Rick Perry is going to have a lot to do with that," he said. The order stands to reinforce the idea that Trump is deeply suspicious of climate science, even as his advisers seek to soften his past statements about its being a conspiracy by the Chinese and Democrats. White House press secretary Sean Spicer was asked yesterday during the White House daily briefing if Trump still believes that climate change is a hoax. Spicer didn't dispute it. Instead, he said the president would talk about "the climate and what he believes" when he signed yesterday's order. That didn't happen. "He does not believe that, as I mentioned at the outset, that there is a binary choice between job creation, economic growth and caring about the environment," Spicer said. "I think, at the end of the day, where we should be focusing on is making sure that all Americans have clean water, clean air, and that we do what we can to preserve and protect our environment." The president's focus on coal yesterday harked back to promises he had made for more than a year to reopen coal mines and put workers in hard hats and reflective stripes back to work. The order yesterday began a countdown to making those promises real. Announcing the end of a rule, which miners detest, is one thing. Putting them back to work is another. Many experts say there's no easy way to resuscitate Appalachian coal towns, which face bigger challenges than government regulations, like plentiful and cheap natural gas. Spicer said yesterday that the administration hasn't estimated how many jobs might be created by rolling back the Clean Power Plan. Earlier this week, a senior administration official acknowledged that several pressures "conspire" to affect the coal industry, with regulations being just one of them. The president doesn't influence all of them, but he will do his part to make government a better friend to coal, the official said. The question is whether that's enough. Miners were happy yesterday, but if they continue to feel as if the dice are weighted against them, some of them might begin to see Trump as just another Washington politician. "I think people need to see mines reopening," said Glen Bolger, a Republican pollster. "There's risk in everything in politics. You can't deliver on everything. But you have to deliver enough things." Protesters demonstrate outside the White House against an executive order signed yesterday that eliminates former President Obama's climate change regulations. Photo by Kavya Balaraman. Actually rolling back the Clean Power Plan will likely be a multi-month process, blighted by legal challenges if EPA tries to get rid of the rule without putting in a replacement. That is because the agency is under a legal obligation to act, first because greenhouse gases are an air pollutant, and second because those greenhouse gases endanger public health and welfare, said Steven Silverman, a former EPA attorney under President Obama. "Leaving nothing in place I don't think is a legal option, so long as the endangerment finding stands," said Silverman. He noted that EPA has a lot of discretion to weigh cost, feasibility and lead time while writing regulations but would still have to account for facts already compiled in the administrative record that were used to justify the creation of current regulations. "There would be legal ways to adopt significantly less stringent standards to pass legal muster. I can think of some, but I don't want to tell them," Silverman said. Though the Trump administration has singled out the Clean Power Plan as a main culprit in killing coal jobs, Silverman pointed out that the Obama administration saw at least the new source standard for power plants as a "lifeline, not an albatross," for the coal industry. "It's a technology that captures emissions, it can put those CO2 captured emissions to product use, for enhanced oil recovery for example, or safely sequestered. It's a way for that industry to coexist with a world that is trying to cope with climate change," he said. New York Attorney General Eric Schneiderman (D) said his office would oppose efforts by Trump's Department of Justice to freeze the case currently residing in the U.S. Court of Appeals for the District of Columbia Circuit, as instructed by the executive order. "We intend to oppose any effort to hold in abeyance the litigation to defend the Clean Power Plan and any effort to roll it back," Schneiderman told reporters yesterday. In the hours before Trump made his first appearance at the agency, EPA headquarters closed its shades in preparation for the president's arrival, as heightened security patrolled the grounds. Staff mulled the consequences of the administration's recent actions on the agency. "People are just keeping their doors shut. The president coming here is a deliberate stick in our eye," said one employee, who worked in enforcement of the Clean Water Act but declined to give his name. "Keep calm and carry on is the mantra," said another EPA staffer. "Hopefully, everything will get straightened out," she added. Fossil fuel leaders cheered the order. "Today's action by President Trump calls on his administration to review existing federal agency policies that have held back American energy production, rescinding rules that have limited our economic growth with little benefit," Independent Petroleum Association of America President Barry Russell said in a statement. The reactions on Capitol Hill, meanwhile, underscored the partisan divisions on climate change. Republicans in energy-rich states celebrated the administration's hands-off approach to fossil fuel development. They represent industries that for years have suggested that Obama's actions symbolize a social prejudice against oil and coal. "After eight years of radical environmental policies from the White House, we now have a president focused on bringing coal jobs back," said Rep. Evan Jenkins (R-W.Va.). Democratic argued that Trump's move would only introduce uncertainty into the business environment and would do nothing to create an economic boost. Sen. Sheldon Whitehouse (D-R.I.) predicted that the regulatory rollback would be unlikely to survive court challenge, particularly as Pruitt plans to keep the Obama-era endangerment finding for carbon intact. "I don't think he has a lot of real running room rather than to delay for a bit and wait for that litigation," said Whitehouse. "They're playing with fire here, and I think they're going to find that they'll be burning their fingers." In the evening, scores of environmental activists gathered in front of the White House to condemn the executive order. 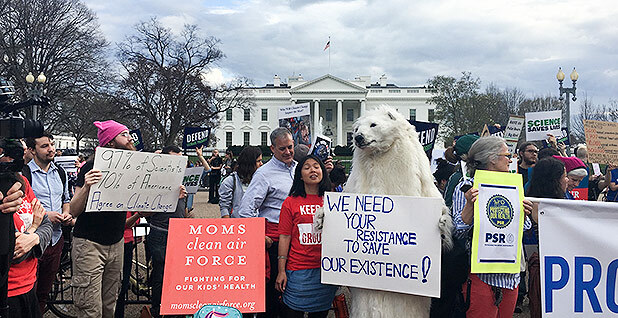 Holding up signs demanding clean air and climate justice, they criticized the administration for rolling back clean energy initiatives that boosted both local economies and health, saying that the order provided businesses with a green light to pollute. Sen. Ed Markey (D-Mass. ), who also attended the rally, encouraged the public to fight Trump and the "Big Oil cartel." "Today, Donald Trump did not sign an executive order. He signed a declaration of war against a clean energy revolution, against climate change as a science," he said, adding that the order was a symptom of climate denial, rather than a step toward energy security. "[W]e know what his formula is on climate change: Deny, delay, defund — and it will create a disaster for the entire planet," said Markey. Laura Anderko, director of Georgetown University's Mid-Atlantic Center for Children's Health and the Environment, said that the Clean Power Plan would have saved 300,000 sick days a year if implemented through 2030, as well as prevented 90,000 asthma attacks in children on an annual basis. "We need to help the administration understand that clean air means good health," she said. Reporters Jean Chemnick, Umair Irfan and Kavya Balaraman contributed.